If you like this post, pass it on to your friends. Let’s keep the conversation going. 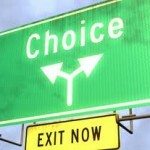 At every turn in our lives, we’re faced with choices. When I was diagnosed with ALS in November, 2010, little did I know about the choices I would be facing. But here I am, making them. Part of my ability to make choices is about resources: money, care providers, and my medical team come to mind. But I think more of my choices are about my attitude. I think there are essentially two ways of facing any life-threatening or fatal illness: surrendering to it, or trying to manage it. Since surrendering is not my usual m.o., I’m not surprised that I’m trying to manage it to the extent I can. Controlling it is out of the question until research develops treatments that work. Here are four examples of my approach to ALS. They involve the use of technology to talk, a feeding tube, a neck brace, and wheel chair. My ALS is characterized by what is called bulbar onset. That means it first affected the muscles of my mouth and throat. My first symptom was slurred speech. Then it became hard for me to project my voice. With the help of Amy Roman, a fabulous speech therapist at the Forbes Norris Clinic where I’m seen for ALS, I learned about a microphone and amplifier to project my voice. 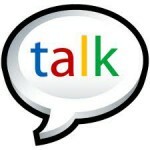 (For information on this technology see an earlier blog posts entitled There Goes That Person With . . . and Helping Each Other – It’s Not So Hard. Maybe I looked funny walking down the street with a mike in front of my mouth, but at least I could be heard. Is it perfect? Not by a long shot. But, for me, it is way better than being silenced or struggling to make what is left of my ability to speak understood. 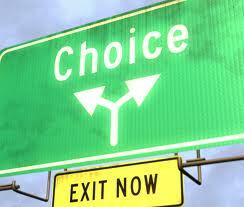 A choice. The weakness in the bulbar muscles means that I developed trouble swallowing liquids and food. While not everyone with ALS will develop problems swallowing, many will. There are two big problems that accompany problems with swallowing: the risk of choking, and the risk of aspirating small bits of food or liquid into your lungs and developing pneumonia. Neither is a pretty picture. This a PEG Tube. The right hand end is in my stomach. The left hand end is where the food goes in. As my swallowing got worse, it took me longer and longer to eat a meal, and choking was a common occurrence. 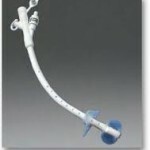 Rather than wait until I ended up in the hospital with pneumonia, I decided I should get a feeding tube. 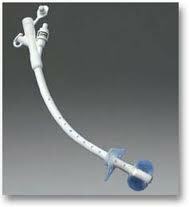 It’s called a PEG (percutaneous endoscopic gastrostomy) tube. It’s a tube in my stomach that comes out through a hole just above my belly button. At the end of the tube is port through which liquid nutrition (and medication, and alcohol or coffee or tea) enters the tube and then my stomach. The nutrition I get is a liquid that comes in a can. (And it’s a prescription, so my food is paid for by MediCare.) To maintain my weight, I consume 5.5 cans of this stuff a day. And I also take in water through the tube to stay hydrated. It’s not as much fun a eating was by a long shot, but eating had ceased to be fun for me by the time I decided to get the tube. But I can nourish myself (at least for now), and can do it discretely even in restaurants when we’re out with friends. Have tube, will travel. I could have waited until something dire happened that forced me to get a tube. But, for me, getting the tube before that was a much better approach. It leaves me — for now at least — in control of my food intake, and without the risk of something awful happening. Seems that some of my muscles that are not getting the nerve messages they need to work right are the muscles that allow me to lift my head after I bend over. I had two choices here: go around with my eyes focused on the ground a lot, or get a neck brace to help me hold my head up. There is a terrific physical therapist at the Forbes Norris Clinic, Michelle Mendoza. I’m at the clinic every 3 months. The last time I was there, in February I asked to talk to Michelle. I explained my issue, and Michelle had several approaches for dealing with it. She discussed them with me, and showed me the devices and let me try them on. 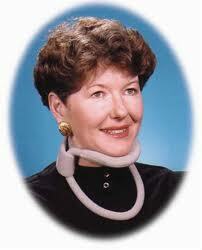 My neck brace looks like this. I don't. from falling to low on my chest, so my muscles don’t have to work so hard to lift my head. Is it fun? No. Does it help? Yes. I imagine that some people don’t want to consider solutions like these because they don’t like the way it looks. But I would rather look a little out of the ordinary and be able to function as well as I can as long as I can. Choice made. 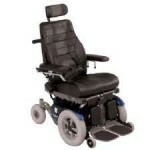 As I type this blog, I’m sitting in a wheelchair at my desk. I don’t use the wheelchair all the time, because I don’t need to. So why do I have it? The Permobil 300. Lots of bells and whistles. Walking has become more difficult for me over time. I can still walk, usually with the assistance of a walker with wheels, but it’s tiring because it requires so much effort to do it. So, when I get tired, I take to my wheelchair. It minimizes fatigue. It’s that simple. I know some people don’t want to be in wheelchairs if they don’t have to be. I guess the question is what is meant by “have to be.” I have to be if I want to conserve my energy and be as high functioning as I can be for as long as I can be. I didn’t need to wait until I took a serious fall to think about a wheelchair. Barring a medical miracle or a tornado hitting our house, ALS will get me one day. But, until that day comes, I will work to manage what I can. Using aids like the ones I describe here enables me to continue to function at the level my energy permits. I have a lot to live for, and a lot to do. Surrender is not an option for me. This entry was posted in ALS, Disability, Illness and tagged Amy Roman, Michelle Mendoza, neck brace, PEG tube, text-to-speech, text-to-voice, wheelchair. Bookmark the permalink. You are an incredibly brave person! My husband has limb onset, diagnosed 2/11. We are dealing with quite a bit right now, and he is handling it like a champ. Amazes me everyday. Never know what you can endure until you are faced with it! Prayers for you!!! Ever the teacher, your posts help us all learn how to be both practical and courageous. Thank you, Barb. I always thought you were one of the gutsiest people I’d ever met. I’m more convinced than ever. I’m thinking of you. That was very helpful, Barb, not just in terms of the specifics, but the philosophy of making decisions and embracing change. These little posts of yours are so terrific, Barb, I wonder if you even know! You have so much to teach about activism itself! We are working hard to involve health based organizations to come to the realization that exposure to the toxins in residential wood smoke is 12 times more carcinogenic than tobacco smoke, a significant factor in cardiovascular disease, and implicated in auto immune disorders, type two diabetes, Parkinson’s disease, and cognitive deduction. We clearly do not know how to reach such organizations and are puzzled as to how to make connections that will result in garnering attention for this extremely dangerous source of air pollution. How did you manage to get some breast cancer orgs to look at risk reduction? Like I said the last time I was with you…You are such an inspiration Barbara. Thanks for being you and doing things your way and making conscious choices- inspiring! May we all make such onscious choices with whatever we are dealing with. Barbara, many blessings on you as you demonstrate to others how to live. The two people in my life who had ALS taught me similar lessons. My brother Paul died two years ago–exactly a year from diagnosis. His mobility was affected first.One of his major fears was that he would not be able to communicate and by the time he lost the ability to speak he had also lost the ability to use hands or anything else to use electronic devices. Sr. Anna May McFeeley, one of our sisters, died a few months ago. With Anna May, speech was affected first and, although she spent most of her time in a wheel chair by the time she moved to our nursing home, she was still able to use her electronic device to communicate. She also had a feeding tube. Both Paul and Anna May may have lost many of the functions that we deem essential but what they didn’t lose was their sense of self and their sense of humor. Paul managed to tease the nurses with his eyes and a somewhat lopsided grin when nothing else worked. And Anna May, at a Christmas party at our nursing home managed to get herself out of the wheelchair to do a few steps to both the Mummers’ Strut and the Electric Slide. The human spirit is indeed pure gift. Thank you for sharing yours with us! I am so glad I found your blog. I also have bulbar onset ALS. I am reading all your entries and feel like I have found a soulmate. Thank you. Two weeks ago today I was diagnosed with bulbar ALS at Forbes Norris. My journey in this twilight zone is just beginning. I found your blog and responses. I look forward (a phrase I need to repeat) to sharing with others while I can. The staff is excellent at the clinic. Life has changed so quickly. My father has bulbar ALS and is in need of a neck brace. 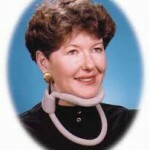 He saw your picture on this website- could you tell us where we could find this type of neck brace? We would really appreciate any help you could give us.